One of the things I've really enjoyed throughout this year of sketch noting is the encouragement, inspiration, and camaraderie in the visual note taking community. One of the members of that community is Doug Neill, author of The Verbal-to-Visual notebook, author of two visual thinking blogs and host of the Verbal-to-Visual podcast. I think Doug and I started on our respective visual thinking journeys around the same time and it's been really great to follow along and learn from his process. 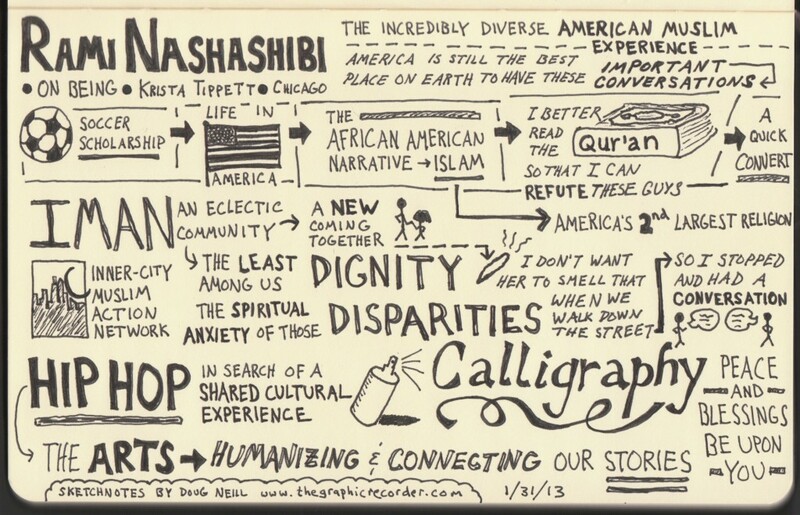 It's always cool to feature notes from folks other than me here on Sketchy Ummah and in this post I'm featuring Doug's notes on a really intriguing interview with Dr. Rami Nashahshibi. I really like Doug's style and ability to whittle down the main points to one small page. You can check out the interview & notes below. My first intro to Dr. Nashashibi was another interview that he did with Ustadh Usama Canon which thought there is some overlap is also worth checking out, in about a 1/2 hour both tears and laughter in the part of the host. Thanks also to Doug for exposing me to On Being which I hadn't previously listened to, there are actually quite a few other Muslims who Krista Tippet has interviewed which can be found here.